Happy November! 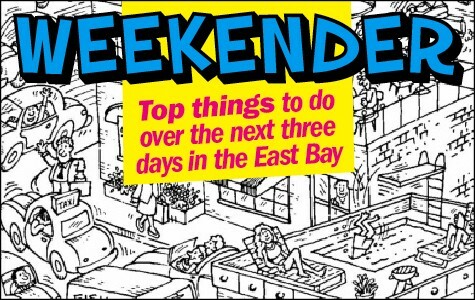 Here's what you're doing this weekend. The fact that playwright Brian Thorstenson based his new work, Embassy, on a Joan Didion quote should tell you two things: First, that it's high-minded, and second, that he didn't intend for it to be intelligible. Hence the bizarre plot: An ambassador on an unnamed Caribbean island is trying to remodel his embassy, right as the US government issues orders for him to redeploy to war-torn New Kazakakurgistan. And there's more complication, in the form of a boat of low-wattage light bulbs sailing in from Venezuela, a bat-guano harvesting operation, secret agents, mistaken identities, and someone called "The Third Man." Got it? If not, don't worry. The main selling point of this play is the character acting, which is singularly fantastic. Richard Frederick plays the likeable dandy, Ambassador Blundercart; Olivia Rosaldo plays his sassy housekeeper (and main eavesdropper) Carmelita; and Cole Alexander Smith is improbably convincing as The Third Man, whose entrance in Act II is preceded by Johnny Rivers' "Secret Agent Man." Gary Graves directs. Through Nov. 20 at BerkeleyCity Club (2315 Durant Ave., Berkeley). $14-$25. 510-558-1381 or CentralWorks.org — R.S. Space lovers will find ample opportunity for stargazing at the Bay Area-wide Star Party on Saturday, Nov. 5, in which twenty schools, observatories, and science centers from Antioch to Walnut Creek (including Berkeley's Lawrence Hall of Science at 1 Centennial Dr.) open their doors and share their telescopes for free observations of the night sky. Held in conjunction with the nine-day Bay Area Science Festival, the event features viewings and observation tips by both professional and amateur astronomers, plus astronomy-related lectures and events at certain locations. Check website for a full list of participants and activities. 7-11 p.m., free. 650-949-7888 or AstroSociety.org/events/starparty.html — C.H.